For their third release the Mighty Robots deliver the re-release of two lost 90's UK electro gems by the dormant Scottish production/graffiti crew Voigt Kampff, featuring one of the UK’s most underrated producers - Andy 'DolB' Balneaves (aka Machine Tree, Silver Locusts and one half of The Andies). 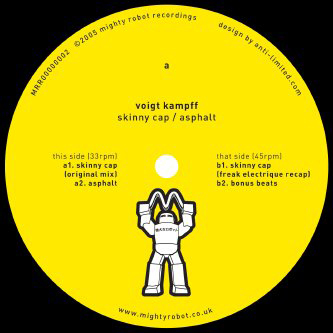 'Skinny Cap' was originally released on Penalty - albeit in very limited quantities - and can be best described as 'organic electro'. Built heavily on 'found sounds' (the main percussion is constructed around a sample of a shaken spray can), the composition has a twisted live feel with its jerking and rolling rhythms, bleeps and tweaks, scratching and vocoder action. This lost track is a world away from most of today's rigid electro-by-numbers and a must-have for serious electro-heads. 'Asphalt' is taken from Voigt Kampff's infamous 'Real Men Use Carplan EP', originally released on Panic Trax (and currently changing hands for serious money on eBay). On the flip , Rotterdam's Freak Electrique have taken 'Skinny Cap' and strapped on some stomach-churning bass frequencies to maximum effect. Retaining the original structure but adding some rocking dancefloor tricks and a Galaxianbreakdown, the Dutchmen have dropped a monster of a tune, which will worry even the best of bass bins. Play loud!